Ernest Hemingway – American journalist, novelist, and short-story writer. 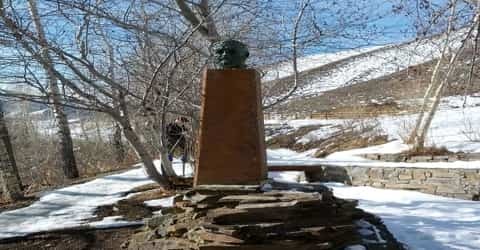 Place of Birth: Oak Park, Illinois, U.S.
Place of Death: Ketchum, Idaho, U.S.
Born as the first son to well-educated and well-respected parents in Illinois, he had a comfortable childhood during which he developed a keen interest in reading and writing. As a school student, he excelled in English and was a regular contributor to his school newspaper, ‘Trapeze and Tabula’. An athletic boy, he also took part in boxing, track and field, water polo, and football. He decided early on that he wanted a career in writing and started off as a journalist before becoming a writer of short stories and novels. Hemingway produced most of his work between the mid-1920s and the mid-1950s, and he won the Nobel Prize in Literature in 1954. Over the course of his writing career, he published seven novels, six short story collections, and two non-fiction works which greatly influenced later generations of writers. A highly acclaimed writer, most of his works are considered classics of American literature. His critical reputation rests solidly upon a small body of exceptional writing, set apart by its style, emotional content, and dramatic intensity of vision. Hemingway went on to serve in World War I as an ambulance driver in the Italian Army before returning to America and establishing himself as a distinguished fiction writer. In spite of all his professional successes as a writer, Hemingway’s personal life was a constant struggle with numerous broken marriages and bouts of depression. He maintained permanent residences in Key West, Florida (in the 1930s) and Cuba (in the 1940s and 1950s). In 1959, he bought a house in Ketchum, Idaho. Deeply troubled by his personal sufferings, he committed suicide in 1961. Ernest Hemingway, in full Ernest Miller Hemingway, was born on July 21, 1899, in Oak Park, Illinois. 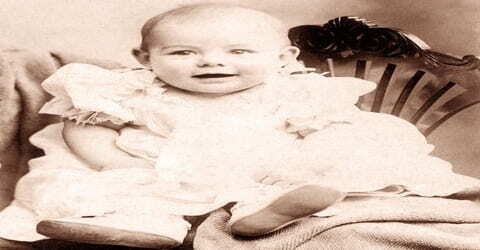 His father, Clarence Edmonds Hemingway, was a physician, and his mother, Grace Hall-Hemingway, was a musician. Both his parents were greatly respected in their conservative community. Hemingway’s early years were spent largely in fighting the feminine influence of his mother while feeding off the influence of his father. He spent the summers with his family in the woods of northern Michigan, where he often accompanied his father on professional calls. The discovery of his father’s apparent lack of courage, later depicted in the short story “The Doctor and the Doctor’s Wife,” and his suicide several years later left the boy with an emotional scar. Despite the intense pleasure, Hemingway took from outdoor life and his popularity in high school where he distinguished himself as a scholar and athlete he ran away from home twice. However, his first real chance for escape came in 1917, when the United States entered World War I (1914–18; a war in which forces clashed for European control). Eager to serve his country in the war, he volunteered for active service in the infantry (foot soldiers) but was rejected because of eye trouble. On July 8, 1918, not yet 19 years old, Hemingway was injured on the Austro-Italian front at Fossalta di Piave. Decorated for heroism and hospitalized in Milan, he fell in love with a Red Cross nurse, Agnes von Kurowsky, who declined to marry him. These were experiences he was never to forget. Ernest Hemingway was married four times. His first wife was Elizabeth Hadley Richardson who he wed in 1921. The couple had one son. Hemingway became involved in an affair with Pauline Pfeiffer during this marriage. When his wife came to learn of it, she divorced him. He married Pauline Pfeiffer in 1927 soon after his divorce. They had two sons. Hemingway was not faithful to Pauline either and developed a relationship with Martha Gellhorn which led to his divorce from Pauline in 1940. When Hemingway first arrived in London, he met Time magazine correspondent Mary Welsh, with whom he became infatuated. Martha had been forced to cross the Atlantic in a ship filled with explosives because Hemingway refused to help her get a press pass on a plane, and she arrived in London to find Hemingway hospitalized with a concussion from a car accident. Unsympathetic to his plight, she accused him of being a bully and told him that she was “through, absolutely finished”. The last time that Hemingway saw Martha was in March 1945 as he was preparing to return to Cuba and their divorce was finalized later that same year. Meanwhile, he had asked Mary Welsh to marry him on their third meeting. In 1944 while in London, Hemingway met and soon married Mary Welsh, a Time reporter. His three previous marriages to Hadley Richardson, mother of one son; to Pauline Pfeiffer, mother of his second and third sons; and to Martha Gelhorn had all ended in divorce. Following the war, Hemingway and his wife purchased a home, Finca Vig&iacute; a, near Havana, Cuba. After leaving high school Hemingway joined ‘The Kansas City Star’ as a cub reporter. He worked there for only six months but learned several valuable lessons that would help him in developing his own unique style of writing. 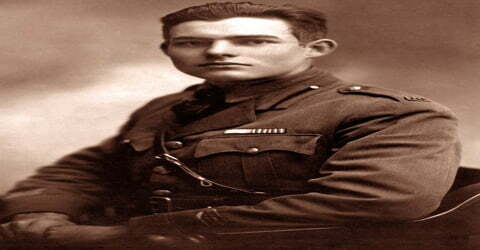 In 1918, Hemingway went overseas to serve in World War I as an ambulance driver in the Italian Army. He was badly wounded in the knee yet carried a wounded man on his back a considerable distance to the aid station. After having over two hundred shell fragments (parts of bullets) removed from his legs and body. For his service, he was awarded the Italian Silver Medal of Bravery, but soon sustained injuries that landed him in a hospital in Milan. Hemingway soon returned home where he was hailed as a hero. Hemingway returned home in 1919 and accepted a job in Toronto, working as a freelancer, staff writer, and foreign correspondent for the ‘Toronto Star Weekly’. He continued writing stories for the publication even after moving to Chicago in September 1920. 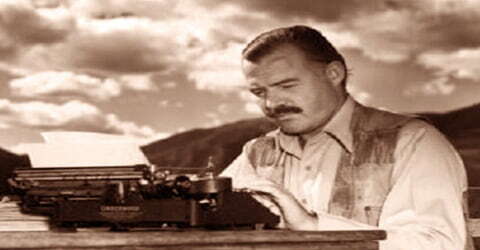 In 1921, Hemingway was hired as foreign correspondent for the ‘Toronto Star’ and moved to Paris. 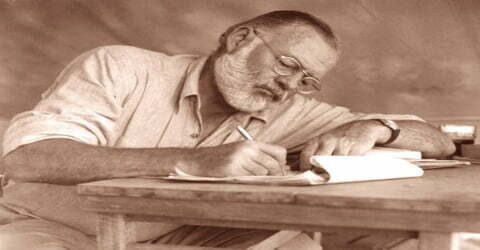 It was in Paris that he embarked on a full-fledged career as a writer and wrote 88 stories within a span of 20 months! He covered the Greco-Turkish War and wrote travel pieces, and published his first book ‘Three Stories and Ten Poems’ in 1923. Advised and encouraged by other American writers in Paris F. Scott Fitzgerald, Gertrude Stein, Ezra Pound he began to see his nonjournalistic work appear in print there, and in 1925 his first important book, a collection of stories called In Our Time, was published in New York City; it was originally released in Paris in 1924. Hemingway, Hadley and their son (nicknamed Bumby) returned to Paris in January 1924 and moved into a new apartment on the rue Notre-Dame des Champs. Hemingway helped Ford Madox Ford edit The Transatlantic Review, which published works by Pound, John Dos Passos, Baroness Elsa von Freytag-Loringhoven, and Stein, as well as some of Hemingway’s own early stories such as “Indian Camp”. When In Our Time was published in 1925, the dust jacket bore comments from Ford. “Indian Camp” received considerable praise; Ford saw it as an important early story by a young writer, and critics in the United States praised Hemingway for reinvigorating the short story genre with his crisp style and use of declarative sentences. In 1926 Hemingway published The Sun Also Rises, a novel with which he scored his first solid success. A pessimistic but sparkling book, it deals with a group of aimless expatriates in France and Spain members of the postwar Lost Generation, a phrase that Hemingway scorned while making it famous. This work also introduced him to the limelight, which he both craved and resented for the rest of his life. Hemingway’s The Torrents of Spring, a parody of the American writer Sherwood Anderson’s book Dark Laughter, also appeared in 1926. He continued writing prolifically throughout the 1930s, bringing out novels such as ‘Death in the Afternoon’ (1932), ‘The Short Happy Life of Francis Macomber’ (1935), and ‘To Have and Have Not’ (1937). He also engaged in a lot of adventure including big-game hunting in Africa, bullfighting in Spain, and deep-sea fishing in Florida. Similarly, a safari he took in 1933–34 in the big-game region of Tanganyika resulted in Green Hills of Africa (1935), an account of big-game hunting. Mostly for the fishing, he purchased a house in Key West, Florida, and bought his own fishing boat. A minor novel of 1937 called To Have and Have Not is about a Caribbean desperado and is set against a background of lower-class violence and upper-class decadence in Key West during the Great Depression. The Sun Also Rises epitomized the post-war expatriate generation, received good reviews and is “recognized as Hemingway’s greatest work”. Hemingway himself later wrote to his editor Max Perkins that the “point of the book” was not so much about a generation being lost, but that “the earth abideth forever”; he believed the characters in The Sun Also Rises may have been “battered” but were not lost. The 1940s were also very eventful for him. He began the decade with the publication of one of his most famous works, ‘For Whom the Bell Tolls’ in 1940. The World War II was going on at that time and when the U.S. entered the war in 1941, Ernest Hemingway served as a correspondent. In this position, he witnessed several moments of historical importance, including the D-Day landing. The harvest of Hemingway’s considerable experience of Spain in war and peace was the novel For Whom the Bell Tolls (1940), a substantial and impressive work that some critics consider his finest novel, in preference to A Farewell to Arms. A wonderfully clear narrative, it is written in less lyrical and more dramatic prose (nonpoetry writing) than his earlier work. Following the critical and popular success of For Whom the Bell Tolls, Hemingway lapsed into a literary silence that lasted a full decade and was largely the result of his strenuous, frequently reckless, activities during World War II (1939–45; a war in which France, Great Britain, the Soviet Union, and the United States fought against Germany, Italy, and Japan). In 1942, as a Collier’s correspondent with the Third Army, he witnessed some of the bloodiest battles in Europe. At this time he received the nickname of “Papa” from his admirers, both military and literary. The Hemingway family suffered a series of accidents and health problems in the years following the war: in a 1945 car accident, he “smashed his knee” and sustained another “deep wound on his forehead”; Mary broke first her right ankle and then her left in successive skiing accidents. A 1947 car accident left Patrick with a head wound and severely ill. Hemingway sank into depression as his literary friends began to die: in 1939 William Butler Yeats and Ford Madox Ford; in 1940 Scott Fitzgerald; in 1941 Sherwood Anderson and James Joyce; in 1946 Gertrude Stein; and the following year in 1947, Max Perkins, Hemingway’s long-time Scribner’s editor, and friend. During this period, he suffered from severe headaches, high blood pressure, weight problems, and eventually diabetes much of which was the result of previous accidents and many years of heavy drinking. Following the war in Europe, Hemingway returned to his home in Cuba and began to work seriously again. He also traveled widely, and, on a trip to Africa, he was injured in a plane crash. Soon after (in 1953), he received the Pulitzer Prize in fiction for The Old Man and the Sea (1952), a short heroic novel about an old Cuban fisherman who, after an extended struggle, hooks and boats a giant marlin only to have it eaten by voracious sharks during the long voyage home. This book, which played a role in gaining for Hemingway the Nobel Prize for Literature in 1954, was as enthusiastically praised as his previous novel, Across the River and into the Trees (1950), the story of a professional army officer who dies while on leave in Venice, had been damned. From the end of the year in 1955 to early 1956, Hemingway was bedridden. He was told to stop drinking to mitigate liver damage, advice he initially followed but then disregarded. In October 1956, he returned to Europe and met Basque writer Pio Baroja, who was seriously ill and died weeks later. During the trip, Hemingway became sick again and was treated for “high blood pressure, liver disease, and arteriosclerosis”. By 1960 Hemingway had left Cuba and settled in Ketchum, Idaho. (He expressed his belief in what he called the “historical necessity” of the Cuban Revolution; his attitude toward its leader, Fidel Castro, who had taken power in 1959, varied.) He tried to lead his life and do his work as before. For a while he succeeded, but, anxiety-ridden and depressed, he was twice hospitalized at the Mayo Clinic in Rochester, Minnesota, where he received electroshock treatments. Two days after his return to the house in Ketchum, he took his life with a shotgun. Ernest Hemingway was awarded a Bronze Star for his bravery during World War II in 1947. 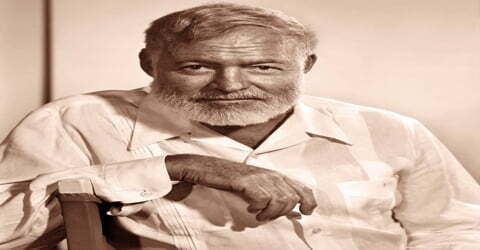 In October 1954, Hemingway received the Nobel Prize in Literature, for the novel ‘The Old Man and the Sea’. 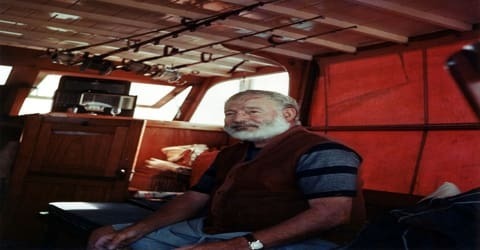 In 1954, Hemingway was awarded the Nobel Prize for Literature for “his mastery of the art of narrative, most recently demonstrated in ‘The Old Man and the Sea’, and for the influence that he has exerted on contemporary style”. Ernest Hemingway’s final years were marked by ill health and depression. He was treated for numerous conditions such as high blood pressure and liver disease, and also struggled with deteriorating mental health. He became increasingly suicidal in 1961 and shot himself to death on the morning of July 2, 1961. Family and friends flew to Ketchum for the funeral, officiated by the local Catholic priest, who believed Hemingway’s death accidental. 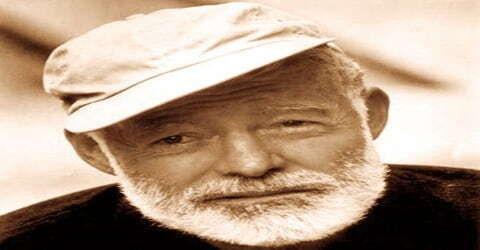 Of the funeral (during which an altar boy fainted at the head of the casket), Hemingway’s brother Leicester wrote: “It seemed to me Ernest would have approved of it all.” He is buried in the Ketchum cemetery. 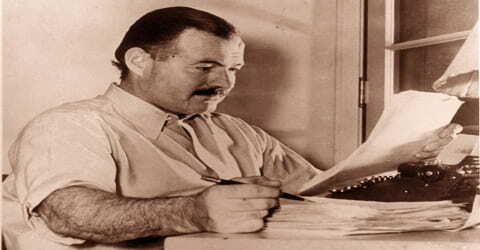 Many of Hemingway’s unpublished and unfinished works were published after his death. Because of his amazing body of work, and his intense approach to life, Hemingway was arguably one of the most influential American writers of the twentieth century. He left behind an impressive body of work and an iconic style that still influences writers today. His personality and constant pursuit of adventure loomed almost as large as his creative talent.